This story comes from the FOIA documents released by the Nuclear Regulatory Commission related to the Fukushima Daiichi nuclear disaster. The message was communicated among NRC officials after March 21st, and offers some great observations on the disaster from the point of view of a commercial airlines pilot. I’m currently still in one piece, writing from my room in the Narita crew hotel. It’s 8am. This is my inaugural trans-pacific trip as a brand new, recently checked out, international 767 Captain and it has been interesting, to say the least, so far. I’ve crossed the Atlantic three times so far so the ocean crossing procedures were familiar. By the way, stunning scenery flying over the Aleutian Islands. Everything was going fine until 100 miles out from Tokyo and in the descent for arrival. The first indication of any trouble was that Japan air traffic control started putting everyone into holding patterns. At first we thought it was usual congestion on arrival. Then we got a company data link message advising about the earthquake, followed by another stating Narita airport was temporarily closed for inspection and expected to open shortly (the company is always so positive). From our perspective things were obviously looking a little different. The Japanese controller’s anxiety level seemed quite high and he said expect “indefinite” holding time. No one would commit to a time frame on that so I got my copilot and relief pilot busy looking at divert stations and our fuel situation, which, after an ocean crossing is typically low. It wasn’t long, maybe ten minutes, before the first pilots started requesting diversions to other airports. Air Canada, American, United, etc. all reporting minimal fuel situations. I still had enough fuel for 1.5 to 2.0 hours of holding. Needless to say, the diverts started complicating the situation. Japan air traffic control then announced Narita was closed indefinitely due to damage. Planes immediately started requesting arrivals into Haneada, near Tokyo, a half dozen JAL and western planes got clearance in that direction but then ATC announced Haenada had just dosed. Uh oh! Now instead of just holding, we all had to start looking at more distant alternatives like Osaka, or Nagoya. One bad thing about a large airliner is that you can’t just be-pop into any little airport. We generally need lots of runway. With more planes piling in from both east and west, all needing a place to land and several now fuel critical ATC was getting over-whelmed. In the scramble, and without waiting for my fuel to get critical, I got my flight a clearance to head for Nagoya, fuel situation still okay. So far so good. A few minutes into heading that way, I was “ordered” by ATC to reverse course. Nagoya was saturated with traffic and unable to handle more planes (read- airport full). Ditto for Osaka. With that statement, my situation went instantly from fuel okay, to fuel minimal considering we might have to divert a much farther distance. Multiply my situation by a dozen other aircraft all in the same boat, all making demands requests and threats to ATC for clearances somewhere. Air Canada and then someone else went to “emergency” fuel situation. Planes started to heading for air force bases. The nearest to Tokyo was Yokoda AFB. I threw my hat in the ring for that initially. The answer – Yokoda closed! no more space. By now it was a three ring circus in the cockpit, my copilot on the radios, me flying and making decisions and the relief copilot buried in the air charts trying to figure out where to go that was within range while data link messages were flying back and. forth between us and company dispatch in Atlanta. I picked Misawa AFB at the north end of Honshu island. We could get there with minimal fuel remaining. ATC was happy to get rid of us so we cleared out of the maelstrom of the Tokyo region. 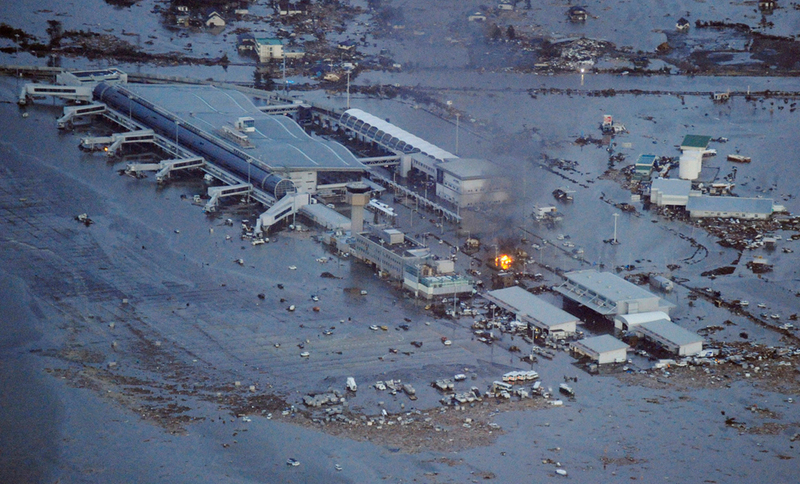 We heard ATC try to send planes toward Sendai, a small regional airport on the coast which was later the one I think that got flooded by a tsunami. Atlanta dispatch then sent us a message asking if we could continue to Chitose airport on the Island of Hokkaido, north of Honshu. Other Delta planes were heading that way. More scrambling in the cockpit – check weather, check charts, check fuel, okay. We could still make it and not be going into a fuel critical situation … if we had no other fuel delays. As we approached Misawa we got clearance to continue to Chitose. Critical decision thought process. Let’s see – trying to help company – plane overflies perfectly good divert airport for one farther away.. .wonder how that will look in the safety report, if anything goes wrong. Enough was enough, I had decided to preempt actually running critically low on fuel while in another indefinite holding pattern, especially after bypassing Misawa, and played my last ace… declaring an emergency. The problem with that is now I have a bit of company paperwork to do but what the heck. As it was – landed Chitose, safe, with at least 30 minutes of fuel remaining before reaching a “true” fuel emergency situation. That’s always a good feeling, being safe. They taxied us off to some remote parking area where we shut down and watched a half dozen or more other airplanes come streaming in. In the end, Delta had two 747s, my 767 and another 767 and a 777 all on the ramp at Chitose. We saw two American airlines planes, a United and two Air Canada as well. Not to mention several extra Al Nippon and Japan Air Lines planes. Post-script – 9 hours later, Japan air lines finally got around to getting a boarding ladder to the plane where we were able to get off and clear customs. – that however, is another interesting story. By the way – while writing this – I have felt four additional tremors that shook the hotel slightly – all in 45 minutes.